Toronto- Senior executives from several major tech companies spoke about the importance of how allyship, including everyone in the conversation, and outlining values can help move the dial for more women and people of colour to be included in the tech workforce. 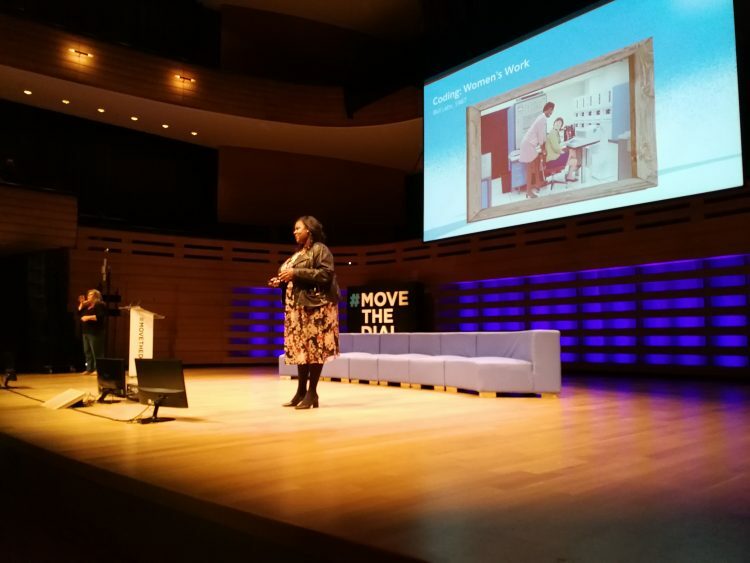 On Wednesday, Nov. 7, the movement #MoveTheDial hosted its inaugural global summit in Toronto, drawing in 1,000 corporate leaders, emerging leaders, and youth to learn about how companies can become more effective in being more inclusive and diverse. While the summit has had mini events in the past, it was never a full-fledged summit that had a concrete schedule of guests, talks, and panels. “We have such a huge opportunity right now because the world is ready for us. The world is ready, and Canada is now finally ready to take what we’re doing and this work to the next level,” Kovitz said while walking and talking at the same time. The on-the-go, walk-and-talk interview reflected her lifestyle – an organized chaos and incredibly busy. Kovitz seemed to know every single person, including the sound technician, make-up artist, and guests attending. “#MeToo and Times Up have played and expedited the need, but also the desire to get very real about this work. There’s no option, not because of those movements, but we need to do more than empower. We also have to actually have solutions,” she said. That day’s keynote speakers included executives from Salesforce, Google, Facebook and Instagram, Uber, and Patreon, among others. Molly Q. Ford, senior director of Global Equality Programs at Salesforce, said at the beginning of the company’s fiscal year, the first thing her company does is outline what its values are. “And make no mistake, equality is a core value for Salesforce,” she said. She added that the company’s practice includes creating equal opportunities by removing barriers for people of colour and women. These Ohana Groups provide a network for different communities, she said. “If you’re LGBTQ, and you want to talk about coming out at work, what does that mean? 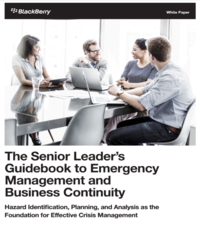 How do you have that conversation?…find your network,” she said. “The second thing is philanthropy. Salesforce employees receive 56 hours a year to be out volunteering in their community. Damien Hooper-Campbell, chief diversity officer at eBay, said in an interview that for eBay it starts with a “broader philosophical conversation around diversity and inclusion,” and envisioning what results from that conversation would look like in practical terms. After he was hired on as eBay’s first diversity officer, Hooper-Campbell took upon himself to travel to as many eBay locations globally to have these conversations and figure out where the gaps were. He added that the team created the first diversity and inclusion survey and launched its Courageous Conversations series to allow employees to talk about issues that matter to them like gender, race, politics, and religion. “We want to make spaces available across eBay where people can remove those barriers and just have a human conversation. It’s still early, but the immediate feedback has been overwhelmingly positive,” he said. Most importantly, Hooper-Campbell said these conversations can’t exclude anyone. “This cannot be us vs. them in terms of an approach. Often times with all good intent, you see women-in-technology groups being formed and there are no men, and men are not even welcome. While we should never waiver from a group like that being focused on women in technology, if we are going to change this, we have to bring other voices in,” he said. He added that having a diverse group of people at work and having open conversations drives an environment that will allow everyone to “bring themselves and all aspects of their background to work,” which in turn drives business. 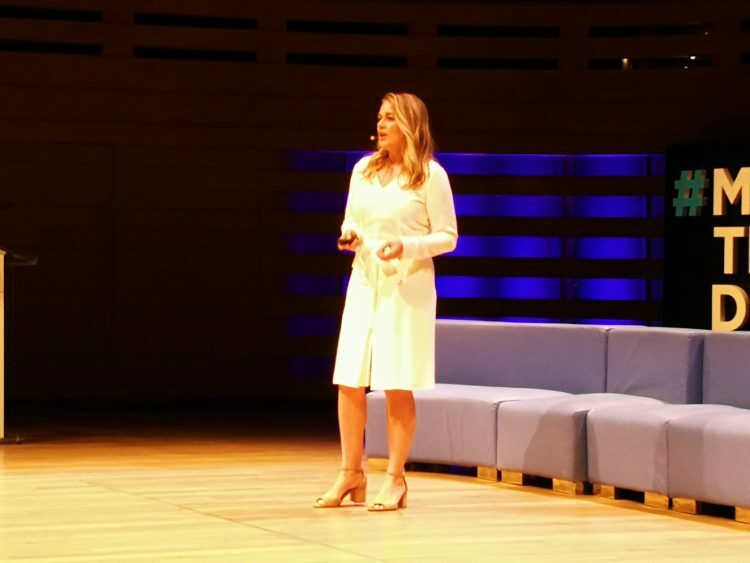 Andrea Van Leeuwen, head of business marketing at Facebook and Instagram Canada, said the driving force for more women to feel included and for more diversity in the workplace is to have better allies. “It’s about creating a strong team of allies who can systematically change a culture,” she said. “The first motion in being an ally is simply being more aware. Point it out. Allies are the people in meetings that notice when we don’t make space for everyone, that notice when we’re not being heard, and that notice when we get cut off, and they’re not afraid to point it out. “Allies are reading body language, listening to the tone of communication. Actively listening…the key here is to check out how someone is feeling to understand their experience,” she said. Kovitz said bringing all these voices wasn’t easy and it took many steps and there were many challenges that came in the way. “It was 17 steps to actually get Salesforce here today. It was 17 phone calls. I didn’t have that connection, I built that connection. And I think that’s the message for everybody to also learn from this…you have to want to do it, you have to believe in the work and you have to work at it,” she said. This year #MoveTheDial launched its Connect mentorship platform that will provide mentorship opportunities for women in tech. The program will “curate and facilitate authentic connections between women in tech who can benefit from the mentorship of accomplished global business leaders,” a Nov. 7 press release said. And Kovitz said this was just the beginning and that there was much more work to do, having more summits, and growing the platform so more leaders can be a part of it.